Bringing the rhythm of Latin dance together with a workout routine is one of the best things to ever happen! This unique, high-energy form of fitness allows people to get healthy and have a blast while doing so. Across Michigan, you’ll find Zumba classes offered everywhere from fitness centers to churches. Here are the 10 best in the state. The Fortitude Fitness Center 24/7 in Ortonville offers up a particular advantage not every Zumba class will have on hand: access to the Zumba Step and straight Zumba subclasses, among a variety of other programs. Since it's also a 24-hour fitness center, even when you're not doing Zumba, you'll have access to the complete range of fitness center options, making this a leader when it comes to Zumba options. Chica's Fitness and Nails in Flint offers not only fitness options, but a complete nail care capability to boot. Focused on “educating and training women on all aspects of being healthy and fit,” Chica's Fitness and Nails offers straight Zumba as just part of the package. Along with kickboxing, boot camp functions, aerobics, muscle toning and plenty of other options, Chica's looks to be the complete package for anyone looking to improve their lives. Houghton's Michigan Tech is fairly enamored with Zumba, featuring not only straight Zumba, but also Zumba Step and Zumba Aqua as part of the lineup. Part of its HuskiesFit Program lineup, and part of the Michigan Tech Recreation program, there's a lot more than that here including various camps and clinics along with outdoor adventure options. Zumba, however, is in regular attendance here at last report, so no matter what your exercise of choice, you should be thoroughly accommodated here. The Z Spot Fitness Studio in Plymouth makes a particular effort to accommodate first-time students, encouraging all such students to show up 15 minutes early for registration. Once in place, Zumba, Zumba Gold, and even Zumba Sentao will be on hand at last report for anyone looking for a Zumba experience. Better yet, there's also kickboxing, strength training, candlelight yoga and more going on here to round out the experience to its fullest. Waterford's Studio 8 Fitness offers something a little extra unusual in its Zumba lineup, specifically, the Zumbini program. Offering Zumbini in the “Kalino Finds the Music” theme, it's a combined development of BabyFirst and Zumba that offers a 45-minute session of music, dance and learning for the younger set. Billing itself as a “one stop shop” for fitness, Studio 8 can go well beyond the basics to create a complete package for all Zumba enthusiasts and beyond. Holland offers up Girlfriends Fit Club, a fitness club geared primarily toward the ladies and offering a full range of options therein. Naturally Zumba is part of the equation here, but so too are Barre, boot camp, body sculpting, hot Vinyasa yoga and a host of other options. Throw in a childcare facility and an active community approach and it's a complete package that understands the specific needs and interests of its clientele. 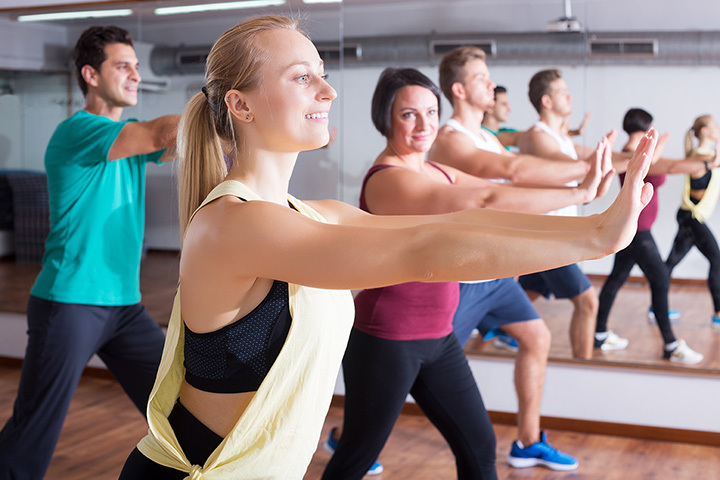 Not surprisingly, Traverse City makes an entrance again on our lists, offering up the Fit For You Health Club that offers two different forms of Zumba: Zumba Gold and Zumba Gold Toning. That's representative of the variety here, as it not only goes beyond Zumba to offer things like core fitness and boxing, but even manages to include a senior exercise division in here for added value and community outreach. There's a lot going on at Fit For You, and only some of it is Zumba based! Zumba is actually the tip of the iceberg at Walker Ice and Fitness—no pun intended—in Walker. It's certainly on the menu, if only the plain-vanilla variety, and from there it only gets more involved and more downright esoteric. Check out the Resistance Interval Power Plyometric Endurance Diet (RIPPED) program or the Skill of Strength (SOS) programs for starters, and from there proceed through a litany of fitness classes that will test just about every muscle you have. Maybe even a few you didn't! Brighton is home to Hamburg Fitness Center and Camp, which features the Aqua Zumba sub-class of Zumba held entirely in a pool. Since it's done entirely in the water, it provides a way to get moving without the stress on the joints that a normal Zumba workout might offer, making it excellent for first timers or those with diminished capacity. Of course, there's more here than Zumba, and plenty of other water-based exercises will be in play for those looking for a good, safe workout. A good Zumba class can come from just about anywhere, and when it can be held in a church's facilities, then you know it's expanded far and wide. Drayton Avenue offers the Zumba Toning subclass of Zumba, and though that's pretty much the outer limits of its fitness offerings, it's still noteworthy enough to land it on this list.